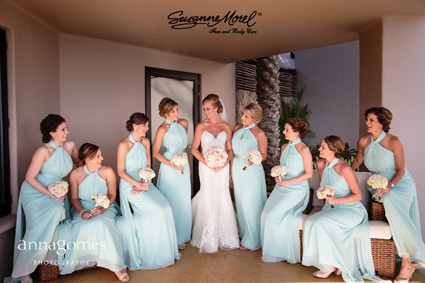 For more than ten years, Suzanne Morel Face and Body Care has offered Los Cabos visitors the best in luxury boutique mobile spa services. As a third-generation spa owner, Suzanne has more than 30 years of experience serving elite clients from all over the world. Her full-service day spa in Fort Lauderdale, Florida, was the first of its kind in the area, growing to 5,000 sq ft with 45 highly trained, licensed employees. She has since brought her expertise to Cabo San Lucas, where she educates her staff about the most effective techniques & treatments to ensure you receive only the best luxury spa services. Suzanne and her staff look forward to pampering you during your stay in Los Cabos. Call us for more information or to book the package of your choice. Aromatherapy oils - $10 extra. This facial has been designed to keep the skin healthy and refresh. 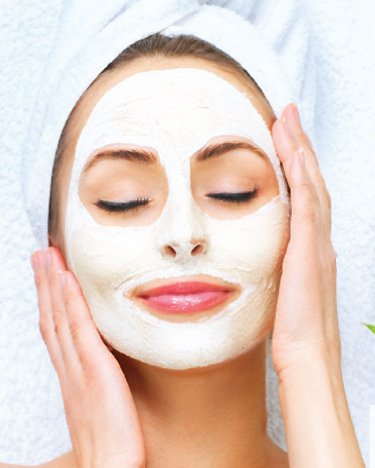 This maintenance facial comes with a bit of extractions and will leave the skin fully purified. This facial is specifically designed for sensitive and sunburned skin, also for those who have rosacea. The special products used for this facial will help stimulate collagen production to minimize further damage. This facial made for more mature skin will increase the moisture level using special selected ingredients in our products to deliver rich emollient, combating and slowing down the aging process. Also comes with an eye treatment. For normal to dry skin, this facial will boost your skin and make it look radiant. It is perfect before any special occasion. This facial was designed to help with the skin’s elasticity. The products used in this facial will help strengthen and deliver a boost of anti-aging ingredients that will plump and firm the skin to make it look younger. Energy Body Balance Package - $295 A Full body exfoliation followed by a 60 min. medium aromatherapy oil massage and an ultra-hydrating facial. Take Time for Youself Package- $210 A 60 min. medium or deep pressure aromatherapy oil massage with a bamboo organic facial. 75 min of Pure Wellness Therapy- $165 Enjoy 15 min of scalp, face and shoulder massage given in the warmth of your Jacuzzi. Followed by 60 min therapeutic pressure point massage. To complete your experience, enjoy an organic mint green tea. Stretching Bliss Massage - $165 (60 min.) / $210 (90 min.) A mix of santé and long movements accompained with hot water pillow preparing your lower back to receive pressure point massage along the spine to create better circulation, reduce inflamation and leave your body in perfect harmony. Finishing with an organic green tea. or a Full Fruit Body Scrub. Mexican Spa Ritual - $265 Begin with a cup of herbal tea followed by 15 minutes of stretching followed by a 60- minute traditional massage using healing Mayan techniques. The Princess Spa Package - $140 For children under 12; includes 30 min. massage, full manicure/pedicure and a facial mask. A MINIMUM OF SERVICES IS REQUIRED IN – VILLA DEPENDING AVAILABILITY AND SEASON. ASK YOUR CABO SPECIALIST FOR A FREE SPA CONSULTATION AT YOUR VILLA. Prices subject to taxes and gratuities. Appointments before 7 AM and after 7 PM will be subject to a 30% after-hour fee. A traveling fee may apply for services outside Cabo San Lucas, (El Encanto De La Laguna, Puerto Los Cabos, East Cape, Cerritos, Rancho Pescadero, Todos Santos) and will be subject to a minimum of services requested. NOTE: A minimum of 2 People plus bride getting Hair & Makeup is required for on location services. If you have less services than the minimum required, you are welcome to come to our salon. 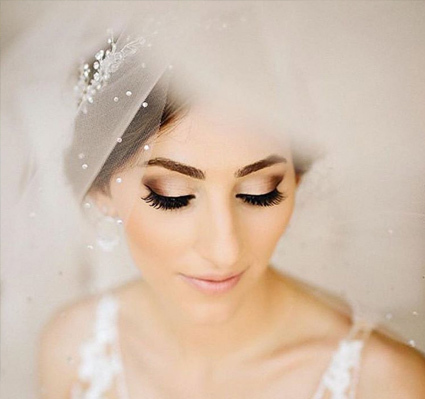 There will be an extra charge for eyelashes application; it is not included in our make-up application charge. 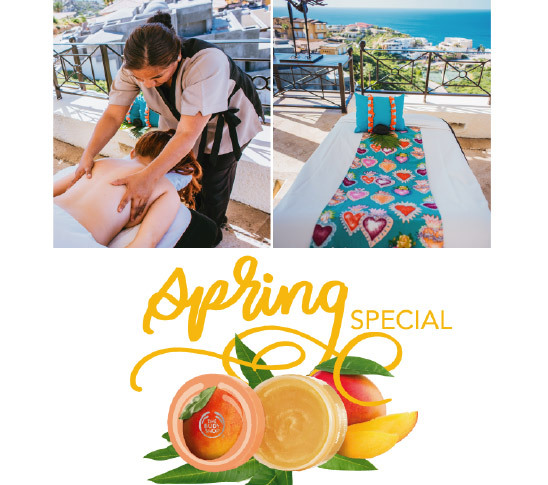 Package 2 - $199/person includes relaxing shoulder massage (30 min), uplifting facial (45 min), moisturizing coconut pedicure (60 min), foot reflexology massage (10 min). Happily Ever After Package - $375 A romantic 60 min couples massage side by side, with aromatherapy oil and a refreshing manicure and pedicure. 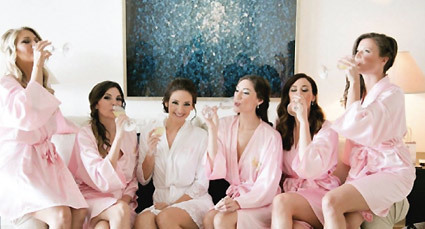 For the Bride Only - Here Comes the Bride Package - $375 Full Body Exfoliation, Bamboo Facial with a 15 min Scalp Massage and a Champagne Manicure and Pedicure. For the Groom Only - The Groom's Essential Package - $190 A spa manicure and pedicure with a purifying cleansing facial. A MINIMUM OF SERVICES IS REQUIRED IN – VILLA DEPENDING AVAILABILITY AND SEASON. ASK YOUR CABO SPECIALIST FOR A FREE SPA CONSULTATION AT YOUR VILLA. Prices subject to taxes and gratuities. A traveling fee may apply for services outside Cabo San Lucas, (El Encanto De La Laguna, Puerto Los Cabos, East Cape, Cerritos, Rancho Pescadero, Todos Santos) and will be subject to a minimum of services requested. A late-hour fee will apply for services before 7 AM or after 7 PM and will be discussed case by case. Can't decide? Spa certificates are available in increments of $100 to use towards any Suzanne Morel Face & Body Care service. You will receive a full brochure upon arrival in Los Cabos and a representative will contact you to set up a consultation/ appointment. Call ESSV for more information. A $50 (plus tax) traveling fee is applicable for all reservations in El Encanto De La Laguna, Puerto Los Cabos, East Cape, Cerritos, Rancho Pescadero, or Todos Santos. For all appointments we require a 48 hrs cancellation notice. A minimum of 2 services is required for us to come to your location. Set Up before 7 am or after 7 pm will have a 30% extra charge. 16% TAX and 18% gratuity not included. Spa staff normally arrive 30-45 minutes prior to scheduled service time in order to set up. Payments made directly to Suzanne Morel Face & Body Care at time of services. All our prices are in US dollars, 18% gratuities and the 16% taxes will be added. These promotions can not be applied with any other promotion. Credit card payments Visa and MasterCard accepted.. Put rest and rejuvenation at the top of your list this vacation. Call us for more information on private spa services.